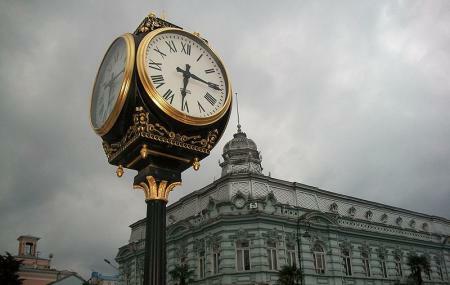 The Europe Square is Batumi’s one such attraction that you will pass several times on your stay here. Deriving its significance from Georgia’s location notable location at the intersection of Asia and Europe, the Europe Square is adorned with structures and edifices of European architecture, that are sure to make you feel like you are somewhere in Europe. Centrally located, this Batumi attraction is in fact a result of Georgia’s joining in the Assembly of European Regions. Accommodating the statue of Medea, this square highlights Batumi’s European association along with ethnic and social analogies with several other prehistoric societies.Throughout the day, Europe Square is resorted to by several tourists and locals alike for a leisure time. As you are wandering around the city, the square will smite you with its peculiar architecture of reinstated buildings. The New Years’ Eve sees several events of fun and frolic at the square. The square is also a popular venue throughout the year for music festivals and events. Another very popular attraction the Astronomical Clock lies right here! While at the Europe Square do not miss seeing the clock for its extraordinary mechanisms. Alobg with time the clock also informs about the relative positioning of the sun, moon, celestial constellations, and sometimes even some major planets, the meridian, horizon, time of sunrise and sunset! If you happen to be in Batumi on the New Year’s Eve, visit Europe Square for exciting events and festivities. This is a lovely place for an evening stroll. Rent a bicycle or on foot. How popular is Europe Square? People normally club together Museum Of Adjara and Colonnades while planning their visit to Europe Square.